Enjoy stress-free walks in the park with your dog, and help train your pet at the same time. The Gentle Leader Head collar is designed to let you communicate with your dog in a way he instinctively understands. 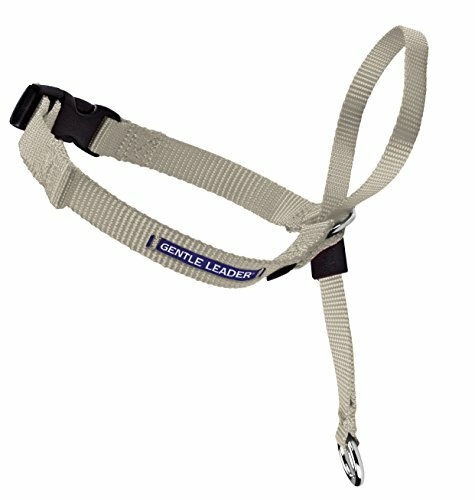 It removes his natural tendency to pull on the leash by placing gentle pressure on calming points and eliminating uncomfortable pressure on the throat. No pain is involved, and the humane Gentle Leader never chokes. By reducing your pet's desire to pull away, the head collar helps combat lunging, jumping, excessive barking, and aggression. The supple nylon straps apply pressure at the back of the neck and front of the throat. It is not a muzzle, and your pet can use his mouth to eat, drink, bark, fetch, and pant. Ideal for dogs 60 to 130-pound and 8 weeks or older. Can be worn up to 18 hours per day. Includes easy-to-follow fitting instructions, abbreviated training guide, and comprehensive training DVD. Also converts to a regular collar after your dog's training is complete.